(CNN) -- The migration patterns of basking sharks have long mystified marine biologists, but new research has finally revealed where the world's second-biggest fish hide out for half of every year. Despite growing to over 10 meters in length, basking sharks have often eluded close scientific study. 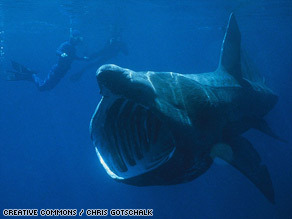 "While commonly sighted in surface waters during summer and autumn months, the disappearance of basking sharks during winter has been a great source of debate ever since an article in 1954 suggested that they hibernate on the ocean floor during this time," said Gregory Skomal of Massachusetts Marine Fisheries, one of the authors of a report recently published in "Current Biology". "Some 50 years later, we have helped to solve the mystery while completely re-defining the known distribution of this species." Using new satellite-tagging and a new geo-location technique, the researchers found that basking sharks make long migrations through tropical waters of the Atlantic Ocean during the winter, traveling at depths of 200 to 1,000 meters. The researcher's data show that the sharks sometimes stay at those depths for weeks or even months at a time. "In doing so, they have completely avoided detection by humans for millennia," Skomal said in the report. Basking sharks are the world's second-largest fish and can grow to more than 10 meters -- more than 30 feet -- and weigh more than seven tons. Skomal said they were "absolutely surprised" when they first received a signal from the tagged sharks coming from the tropical waters of the western Atlantic, in the vicinity of the Caribbean and Bahamas. Before the study basking sharks were believed to be cool-water sharks, restricted to temperate regions. Several factors made basking sharks a challenge to study. Added to their annual disappearing act, they feed exclusively on plankton, which means they can't readily be captured with traditional rod-and-reel methods. Even when the sharks are found closer to the ocean surface, they spend their time in the cool-temperature, plankton-rich waters that limit underwater visibility and make diving difficult. The researchers believe their findings could have important implications for the conservation of basking sharks, which have shown some signs of dramatic decline in the last half century and are listed as threatened by the International Union for Conservation of Nature. "Coupled with recent genetic data, our finding indicates that the Atlantic population -- and perhaps the world population -- are connected and may constitute a single population," Skomal said. "Hence, the global population of basking sharks may be even smaller than previously thought."